Here is some information to whet your appetite to book Casa Matita, or to help you when you arrive in Santa Vittoria. Casa Matita is a little eccentric. It is five storeys high, 8'3" wide and about 24' deep. There is plenty of it, but you need to be willing to climb stairs and adjust to most spaces being very small. The reward is superb – views on three sides. Casa Matita is the house to the right of the three-storey houses, just up as far as the drainpipe. This pic was taken before most of the windows were put in. Here's the front of Casa Matita, as it looks now, Casa Matita has no garden or any outside space, instead, there’s the wonderful loggia. 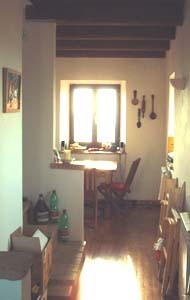 From the little lane at the back, the shutters are closed as it's a hot day, behind them is the kitchen and dining room. 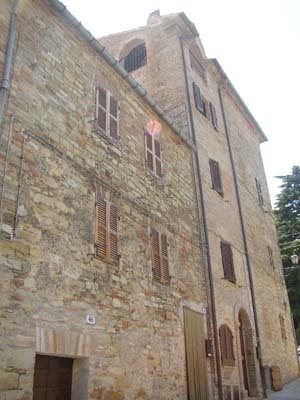 On the top floor is the loggia. From it and from the windows you can see the sea some 30km away if the weather is clear, and the mountains. (The railinged terrace in the picture belongs to the house next door). Ground floor: an entrance hall, washing machine, fridge freezer and a small shower room with wash basin and toilet. There is a large wardrobe with clean bedding, beach and bathroom towels; beach umbrellas and chairs; and a collection of communal hats, gloves and shoes. 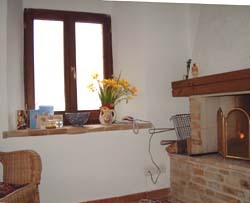 1st floor: front – studio/bedroom/sitting room with a settee that opens out into a double bed and a traditional stone fireplace, views over the street and the countryside and mountains beyond; back – a minuscule bedroom (no views) with a double and single bunk bed, sleeping three adults or, we understand, any number of children. 1st Floor: sitting room with a settee that opens out into a double bed and a stone fireplace, views over the street and the hills and mountains. (the handled grill in the picture is for cooking over the fire). Plus a bedroom (no views) with a double and single bunk bed. 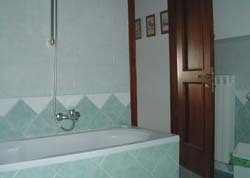 2nd floor: front – a small double bedroom with views over the hills and mountains when you wake up in the morning; back – a good-sized Italian-style bathroom with bath (and shower over), basin, bidet and toilet. 2nd floor: double bedroom with views over the hills when you wake up in the morning. And good-sized bathroom (its tiling in a design that Vincenzo the builder thought the height of taste), with bath and shower over, basin, bidet and toilet. 3rd floor: open-plan space with dining area, seating six; kitchen with sink and draining boards, fridge, dishwasher, work surfaces, fan-assisted electric oven and gas hob, toaster, juicer, small blender, whisk and coffee grinder. 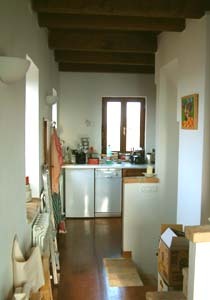 and kitchen with sink and draining boards, fridge, dishwasher, worksurfaces, electric oven and gas hob. 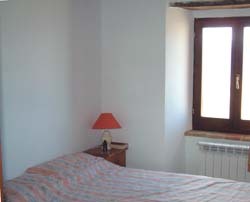 4th floor: open-plan loggia under the roof with views towards the mountains, over the village and towards the sea. Cool in summer, but can be chilly at other times of year. There are two tables up here; two good folding chairs and and four additional folding garden-style chairs, as well as a cupboard containing a hammock, sledge, beach toys and a few gardening bits. 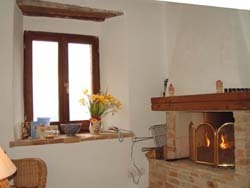 The house has central heating throughout (not the loggia, of course). It is simple, comfortable and well-equipped, we hope. It is ideal for two to four people. Over that, you will need to be adaptable and tolerant. There are seven bed spaces and equipment for eight. 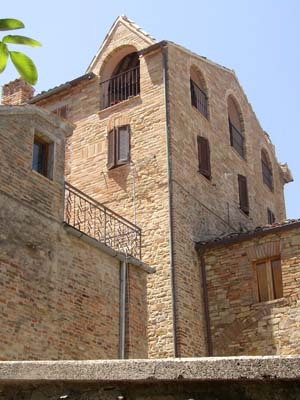 Santa Vittoria is in the Marche (half way down the Adriatic coast, and about level with Tuscany). Ancona is the main town on the coast, and inland are Macerata and Ascoli Piceno. If you draw a north-south line between Macerata and Ascoli, Santa Vittoria is about two thirds of the way down. It is about 20 miles from the sea and the same distance from the mountains of the Sibillini National Park. In between are rolling hills, many of which have a fortified village or town on top. Santa Vittoria is one of these hill towns (they are all different and well-worth exploring), originally called 'Monte Nana', and settled by the Farfense monks. It is now called Santa Vittoria in Matenano because Santa Vittoria's remains are in the church just above our house, apparently. You can see them in glass jars in the crypt. There is also another mini-market at the bottom of via Roma – also good at present; a farmacia (chemist); a newsagent/stationer; a hardware shop; a few giftshops; and three bars; and a market (mostly selling Chinese-made clothing) is held on the second Sunday of each month. The bank with an automatic vending machine is on the main street; and the post office is at the bottom of via Roma on the left – you can buy postage stamps here but it’s much easier to do so from the stationery shop. 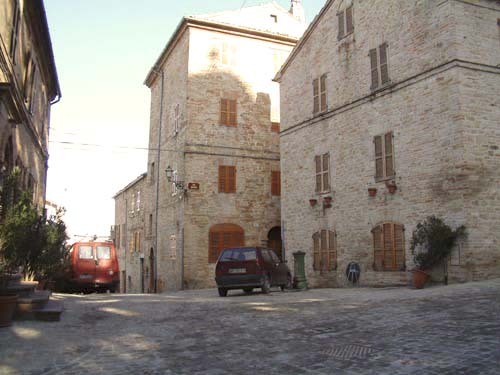 The nearest supermarket – a very good one – is in Piane di Falerone, about 6 miles away. Go down to Servigliano, turn right onto the SS210 main road towards Fermo. Very soon the road goes over a river bridge and then you are in Piane di Falerone. In less than half a mile there is a left turn, signposted to Penna San Giovanni (and to DUM). Take this turn and you will see DUM a short distance along on the right hand side. It is open 8am to 1pm and from 4pm to 8pm Monday to Saturday (closed Thursday pm). There is also an excellent pasticceria (cakes and bread) and a fresh fish shop in Piane di Falerone, on the left, just before the turning to Penna San Giovanni, and a bank and petrol station, both on the right hand side of the main road. There are only two restaurants in the town, though plenty more in the vicinity . On the north side of the main street, not very conspicuous, is the entrance to Hotel Farfense, owned for many years by Giampiero, who does 'front of house' and his wife, Daniella, the chef, supported by their two adult children. Make your way along the entrance hall and turn left down the stairs to the restaurant in the wonderful brick-arched basement. There is also an outside area at the back with views over the valley. The food here is traditional and all home-cooked, often with a local flavour and unusual. They also have a proper wood pizza oven going in the evenings, for take-away as well as eating in. The pizzas are excellent, especially if their son, Federico, is making them. Giampiero speaks pretty-well no English though he’s used to dealing with lots of foreign visitors. Closed on Wednesdays. 0734 780171. If you drop down Via Roma and keep walking straight ahead for a couple of hundred metres, you will come to the Taverna on the left. This is a typical, unpretentious café where you get simple home-cooked food, served by Rosario and his family. The huge television is on all the time, which is standard for Italy, and is part of the experience. Good for both lunch and an evening meal. Full meal or just one course, wine by the 1/4, 1/2 and whole carafe and excellent for people-watching. At lunchtime the clientele tend to be working men or groups of women, evening can be families of great extension, though also single people go in and eat. Very reasonable price. Closed on Tuesdays. Rosario speaks some English as he worked in the 60s at Butlin’s in Skegness and Bognor Regis, it’s slowly coming back to him as the Brits find their way there. The Taverna isn’t gourmet, but what you get is simple and good.